Landscape of Southern Poland / Krakow - Zakopane - Pieniny & Tatra mountains /, Tour programs extra list - discover exciting Poland with us! 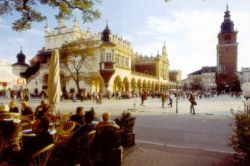 During this tour you will visit an ancient magic city of Cracow with its wide spectrum of museums, art galleries full of exhibitions, theatres, historic cellars, clubs, cafes & restaurants with live music and Zakopane in Tatra Mountains which is considered the winter capital of Poland. Arrival in Cracow, an evening stroll along the Old Town. Welcome dinner in a regional restaurant, overnight stay at a hotel. Breakfast, guided tour of Cracow: the Main Market Square, St. Mary’ s Basilica and historical trade pavilions of the Cloth Hall, the Royal Route, Collegium Maius, Wawel Hill with its renaissance Royal Castle and Cathedral; a walk round the Old Jewish Quarter - Kazimierz, Steven Spilberg came here to shoot Schindler’ s List a multiple Oscar winner. Kazimierz is also a place especially cherished by lovers of antiques. Dinner in a regional restaurant with live folk music, overnight stay at a hotel. Breakfast, excursion to Wieliczka - a visit to the famous Royal Salt Mine with a numerous underground chambers, chapels and salt sculptures. Additional program + option 1 or option 2. Dinner and overnight stay at a hotel. Option 1./ An excursion to Ojcow National Park with picturesque Jurassic landscape and caves, visit to a cave to Pieskowa Skala renaissance castle. Option 2./ A visit an Auschwitz - Birkenau State Museum in Oswiecim the biggest Nazi concentration camp from the II World War. Breakfast, transfer to Zakopane in Tatra Mountains. Guided tour of Zakopne: Gubalowka Hill, old church and cemetry on Peksowy Brzyzek, famous Krupowki street. Dinner in a local restaurant and overnight stay at a hotel. Breakfast, guided tour to Morskie Oko Lake in the heart of Tatra Mountains or Koscieliska Valley. Return to Zakopane, dinner, evening at leisure, overnight stay at a hotel. Breakfast, excursion to Sromowce Nizsze to raftsmen marina, raft trip through Pieniny Mountains on Dunajec Gorge, drive back to Zakopane through picturesque mountains, stops in Debno to visit famous 15th wooden church with rich polychrome, Niedzica to admire picturesque castle with gothic and renaissance parts, lunch in a local restaurant, return to Zakopane, evening at leisure, overnight stay at a hotel. Breakfast, free time by individual arrangements, departure. Winter capital of Poland situated at the foot of the Tatra, the highest mountain range in Poland. The center of the city is at an altitude of 832 m. Excellent staging area for trekking in the Tatra mountains. This legendary fiddler, story-teller and one of the first mountain guides was honored with a statue. As a young man he used to be a mountain robber and poacher. ul. Zamoyskiego/ ul. Chałubińskiego. is a natura heritage park of highlanders’ architecture, with so-called old church from mid 19th century. The church is wooden, shingle roofed, with three altars and sculptures carvedby the highlanders and glass paintings. is the main street of the city. The Tatra Museum, focusing on the history and ethnology of the region, is located at Krupówki. World Cup Ski Jumping competition in January. from early 20th century is a good example of so-called Zakopane style of architecture; St. Witkiewicz Museum in „Koliba”. A hill (elevation 940 m) with thermal sources and Aquatic Park. Highlander’s folklore dress, dialect and music in Zakopane and nearby villages of Kościelisko, Witów, Chochołów, Ciche, Ząb, Poronin and Bukowina Tatrzańska. arranged in the studio of the late set designer, sculptor, painter and poet. Tatra Mountains Tatra National Park inscribed in the UNESCO’s List of World Biosphere Reserves. Numerous trails lead to mountain lakes, valley, waterfalls and caves. Good climbing, cave exploring and trekking area in the summer and skiing grounds in the winter. A fee is charged for entry into Tatra National Park. Swiss pine, edelweiss and crocus, the harbinger of spring, are typical plants in the Tatra. Chamois, gophers and golden eagle live high in the mountains, while in the lower parts common species, such as deer, lynx and wildcat, can be spotted along with brown bears. Morskie Oko This mountain lake situated at an altitude of 1395 m is a favorite destination in the Tatra. Trout live in greenish water with a transparency of up to 15 m. A historic shelter is located nearby. Dolina Pięciu Stawów Polskich A valley offering a magnificent view of Alpine landscape with barren rocks and peaks overhanging mountain lakes. The plant cover is limited to mosses, lichens and grass. Siklawa The biggest waterfall in the Tatra (approx. 70 m high). Impressive during a heavy rainfall, the waterfall attracts many visitors. Giewont A peak of 1909 m with an iron cross 15 m high on the top. Its shape is reminding a sleeping knight. Easily accessible from the south. Dolina Kościeliska One of the most beautiful and easily accessible Tatra valleys. Horse-drawn carriage or sledge rides available. A hill 1120 m high, easily accessible on foot or by cable car, Excellent conditions for skiers and snowboarders in the winter. Take the chair-lift from Butorowy Wierch on your way down to enjoy a vast view of Tatra Mountains. Mt Rysy (2499 m) in the Tatras is Poland’s highest peak. The Tatra National Park has been entered on UNESCO World Biosphere Reserves List, together with the adjoining park area on the Slovakian side. A fine array of hiking trails run to the mountain tops, to crystal clear mountain lakes, wondrous waterfalls, valleys and caves. Mountain-bikers can choose from several well marked bike trails. The trail connecting the town of Zakopane with the mountain lake Morskie Oko is 66 kilometres long both ways. Zakopane itself is the most significant winter sports resort in Poland. In the past, numerous international sports events took place here, for example, the world championships in ski-jumps, world championships in biathlon or world cup in slalom. Ski trails of various difficulty levels await skiers.